Happy Fouth of July, everyone! I just couldn’t let the holiday go by without contributing something red, white, blue and edible. Now, I realize there’s just no topping last year’s American flag tart (gluten-free and dairy-free), so I didn’t even try with the desserts. I decided to go in a completely different direction instead… salad. Before I go any further, let me explain my philosophy on salad. It’s simple: Lettuce alone does not a salad make. A salad should be packed with all sorts of different flavors, textures and colors. It should look exciting, fresh, beautiful… almost like art. The taste should of course match. And the process should be fun! No more boring old lettuce and dressing salads. Blah. OK, I’ve said my piece. Back in the early days of this blog, I wrote a post about how to make a truly satisfying salad. If the idea of making something without a recipe totally freaks you out, I have lots of tips, tricks and how-tos for you here. Hemp seeds (also called hearts) are an excellent vegetarian source of protein. They’re easily digested and absorbed; high in important nutrients like iron, magnesium, essential fatty acids; and a fantastic source of fiber. Hemp seeds are a great pantry staple to keep on hand to turn any salad into a complete meal. Here they’re totally optional. If you want to make this salad to bring to a BBQ or 4th of July picnic, you can take em or leave em. Also, you’ll notice the recipe below doesn’t say exactly how much of everything to use. Just go with amounts that seem right to you. You really can’t go wrong. I’ve never heard anyone complain of a salad having too much avocado or fruit. 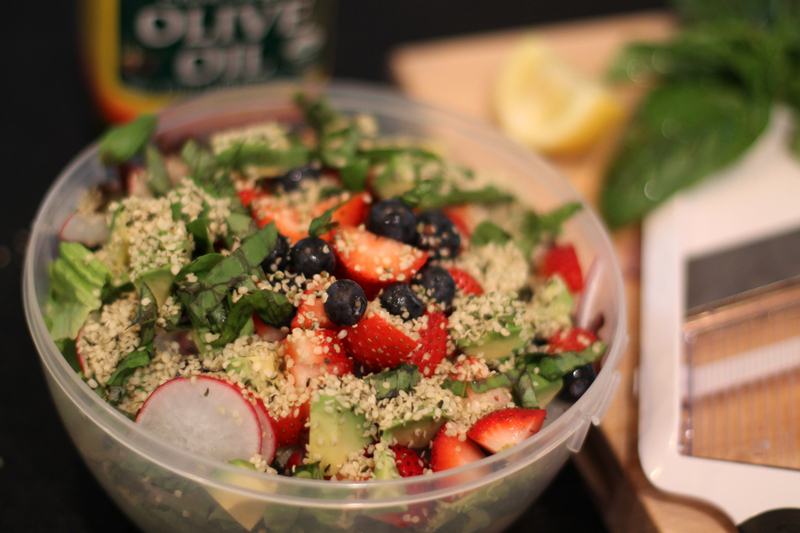 In a bowl combine greens, onion, radish, avocado, berries and hemp seeds. To make the dressing combine EVOO and lemon juice (2:1 ratio) and add a little salt and pepper. Drizzle over salad and toss.